1. 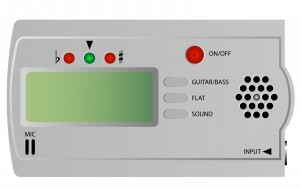 Invest in a proper guitar tuner and use it every time before playing. It may take a bit of effort to learn how to tune the guitar properly, but it will be definitely worth it in the end when you don’t need any external help. This is the most important thing to learn at first! 2. Lessons can get your started faster – like with most other things in life, you can spend a lot of time learning by yourself, or you can have someone show you the ropes and learn the same things in a fraction of that time. Don’t just choose your teacher randomly though – spend some time asking around to find out the best teacher in your area who can take you on. Also, don’t disregard the benefits of your teacher later on when you become more experienced – teachers can always shed some light on the more advanced techniques involved in playing the guitar, and will show you how to organize your studying in a way that you get the most out of it. 3. Keep practicing! This is key to learning the guitar properly. Play those tunes over and over again until you get them right without a single mistake. However, as much as it is important to practice a lot, it’s equally important to know when to take a break to avoid getting burned out. 4. Have a realistic view on your skills and what you should learn next. There are numerous things that are important to master with the guitar, and it’s not unusual to get distracted along the way. All those chords, scales, arpeggios, licks and tunes, etc – all of this must be mastered sooner or later because they’re all important to your success. Realizing the importance of taking in all these skills before you start practicing them will give you a much better chance of retaining your focus and finishing your studies. For example, when you’re learning a new chord, consider its particular importance for your playing. How does it personally benefit you, and how will it help you progress? You must perfectly understand why you’re learning everything you learn. 5. Keep listening to music more actively. You shouldn’t just listen to music regularly – you probably already do that if you’re interested in playing an instrument. However, you should also try to actually listen to the pieces and try to figure out how they’re made, imagine yourself playing all those chords and so on. In addition, try to explore new styles, even if you’ve never listened to those before – jazz, blues, rock, funk and pop, even country and classical music can all teach you new and interesting ways to play the guitar. This is crucial in your development as a musician. 6. Play in bands. You’ll want to do that sooner or later, but even if you don’t want to do it, it’s still important – playing with others allows you to share experience and tips without even talking about it, you can just take in the techniques others are using. This sort of experience will help you quite a lot – you’ll find your playing improving significantly when you’re playing with others. Pretty much everything about your playing will see an improvement – so make sure you start doing this as early as possible. 7. Last but not least, music theory is very important – playing properly isn’t just about randomly finding out a set of notes that sound well, you must understand the actual technical implications of the different composition styles and how you can get the best out of the music you make and play. Music theory is crucial to your success in the long run!